A reference to ‘Hindu Pakistan’ by Shashi Tharoor, in a speech, sparked off another controversy across the media and political circles. The BJP seized the occasion to launch a rabble-rousing diatribe against Tharoor and the Congress. According to Tharoor, “If they (BJP) are able to win a repeat of their current strength in the Lok Sabha, then frankly our democratic constitution as we understand will not survive because they will have all the three elements they need to tear up the Constitution of India and write a new one. That will be a new one which will enshrine the principle of Hindu Rashtra, will remove equality for minorities, that will create a Hindu Pakistan and that isn’t what Mahatma Gandhi, Nehru, Sardar Patel, Maulana Azad and great heroes of freedom struggle fought for” (The New Indian Express 2018). Elsewhere, he repeated: “Pakistan was created as a state with a dominant religion, a state that discriminates against its minorities and denies them equal rights…The BJP/RSS idea of a Hindu Rashtra is the mirror image of Pakistan – a state with a dominant majority religion that seeks to put its minorities in a subordinate place. That would be a Hindutva Pakistan, and it is not what our freedom movement fought for…Many proud Hindus like myself cherish the inclusive nature of our faith and have no desire to live, as our Pakistani neighbours are forced to, in an intolerant mono-religious state” (Tharoor 2018a). As the BJP launched its vituperative campaign, the Congress leadership was reported to have “cautioned its leaders to choose words carefully” (The New Indian Express 2018). 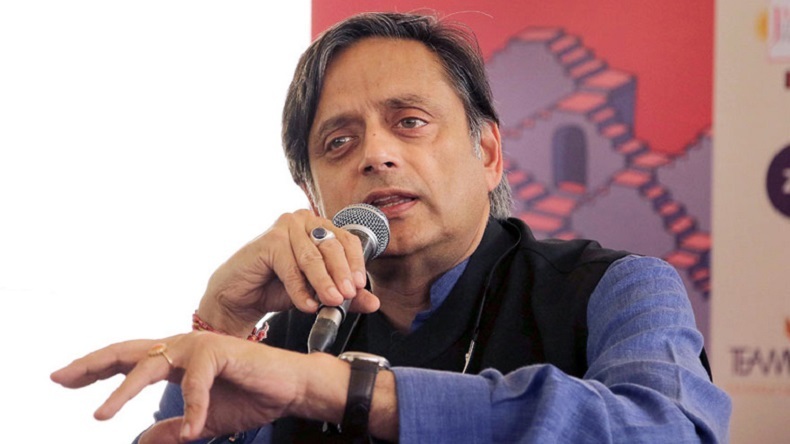 However, many wondered if Tharoor’s reference to “Hindu Pakistan” would have tricky implications given the dimensions of interpretation it can generate within the country, even as the ground is being prepared for the 2019 Lok Sabha elections. Having written a book on Why I am a Hindu, it is pertinent to raise a question if Tharoor should have indulged in such high-voltage demonisation of a sensitive neighbour the reference to which, in fact, has potentials to create a much deeper insecurity complex in India. This is exactly what the BJP has also been doing all these years, and perhaps all successive governments in India too. More than the ‘facts’ involved in the speech, the rhetoric of ‘Hindu Pakistan’ has several implications—the most important of which is the project of cultural securitization. Whether Tharoor actually intended it or not, it tends to set up a platform of frivolous debates, however. Securitization is a strategy in which a State, religion, a group, or an issue is framed as a security ‘threat,’ either directly or indirectly, with a view to mobilizing people in a political project. In this strategy, political forces or the State itself seek to persuade the people to mobilise the state and civil society to challenge this perceived ‘threat.’ Once a religion, a community or the State is ‘securitized,’ it then becomes ‘common sense’ that such religion, a community or the State is indeed a threat. This process ‘normally’ gets underway in political debates and discourses and, more profoundly, in the very strategies of various security apparatuses. The securitization of Muslims/Islam was thus partly a reflection of the colonial project and partly the inherited tradition of the same thinking of the postcolonial state, problematising the process of ‘Muslim integration’ into their nations. Muslims and Pakistan are thus seen as a threat to ‘Indianness’ and Indian identity by their possession of a separate homogeneous religious and communal identity. The Sangh Parivar has been successfully utilizing this securitization project for long (Joshy and Seethi 2015). The successive ruling dispensations and fundamentalist religious forces in Pakistan have also been using this securitization project—seeing ‘Hindu/India’ as a threat to ‘Muslimness’ and the Pakistan identity. Eventually, this ‘otherness’ becomes a legitimizing and mobilizing tool in the hands of leaders, political parties and the State. Needless to say, such comments and subsequent discussions tend to externalise the internal problems of the country or party in/out of power. They may surely divert the attention of the people from vital issues of their survival. The fact that both the Congress and the BJP follow more or less the same neoliberal economic policies, perhaps, attests to this suspicion whether both fronts really cherish national ‘debates’ on trivial issues, rather than on basic socio-economic issues. This is pertinent on the eve of elections. Admittedly, Pakistan has been going through different phases of its crisis throughout history- from the crisis of state-building to challenges of nation-building, from legitimacy crisis to participation crisis. More than half of the political history of Pakistan has been its history as a “Garrison State,” with military playing an overarching role (even under civilian rule). During all these years, Pakistan has also been a willing instrument of the imperialist powers. But when it became a “failed State” with deeper societal crises and having no immediate use for the Pentagon’s global and regional strategy, the West started disowning them. It became neither a ‘theocratic’ State nor a State with deeper democratic credentials. Not even a single party in the country has a credible mass backing. The victims of this misconceived/misconstructed history are the people reeling under multiple pressures of both the State and non-state actors’ disparaging role. Tharoor must be knowing that Pakistan has never had strong political forces capable of delivering any good. Even as any comparison is out of place, the reference to “Hindu Pakistan” has only one implication – generating a fear-psychosis of insecurity, much more than a warning. Many even wondered why Tharoor has not talked about ‘Nazi Germany’ or fascist Italy, instead of ‘Hindu Pakistan’ given the regimented politics of the Sangh Parivar. Expectedly, Tharoor’s statement has come like a shot in the arm for the BJP which has been determined to reap the windfall of ‘security’ issues having cultural meanings. If “Hinduism is a polycentric faith,” as he points out in his book, there should not be any reason as to why we should get worried about its expansion, whether it is in Pakistan or Indonesia. An indispensable culture of the identity of ‘Hindu’ is its essentially secular and pluralistic texture. If anyone is indulged in undermining that culture, it must be addressed internally, rather than externalising it to the extent of demonising other systems and experiences. It also contradicts Tharoor’s own methodology of understanding others. He writes in Why I am a Hindu: “We tend to reduce everyone else to the limits of our own mental universe and begin privileging our own ethics, morality, sense of duty and even our sense of utility. All religious conflicts arose from this propensity to judge others. If we indeed must judge at all, then it must be ‘according to his own ideal, and not by that of anyone else’ (Tharoor 2018b). Elsewhere in the book he points out: “Tolerance, after all, implies that you have the truth, but will generously indulge another who does not; you will, in an act of tolerance, allow him the right to be wrong. Acceptance, on the other hand, implies that you have a truth but the other person may also have a truth; that you accept his truth and respect it, while expecting him to respect (and accept) your truth in turn. This practice of acceptance of difference—the idea that other ways of being and believing are equally valid—is central to Hinduism and the basis for India’s democratic culture” (Tharoor 2018b). Why is that the same “practice of acceptance of difference” does not apply to the most immediate neighbours who have different socio-historical experiences? While Tharoor’s engaging Hinduism (in the book) has a textual dimension, one might also question it from different vantage points (the question of subalternity emerging from the caste inequality is one major dimension). Neera Chandhoke writes that such practices could be debatable. She asks a critical question if “Hindutva can be deactivated by a return to the texts and practices of Hinduism.” Chandhoke points out that “The Hindutva brigade is hardly interested in the complexities of the religion that Tharoor elaborates for us. It is focussed on mobilising the Hindu community for unlimited power.” Herein emerge the intricacies of engaging religious symbols and slogans in public domain and political discourses which had already divided the minds and hearts of people in a variety of ways. The lesson of such experiences tells us that any intended (or unintended) securitisation project has its inevitable insecurity impact—for both the Nation and its citizens. It will only help consolidate the communal agenda of right-wing forces. Joshy, PM and KM Seethi (2015): State and Civil Society under Siege: Hindutva, Security and Militarism in India, New Delhi: Sage India. Tharoor, Shashi (2018b): Why I Am a Hindu, New Delhi, Aleph Book Company.